Originally published in Published in the NSS News, Volume 64, No. 4, April 2006, pp. 7–8. Edited and updated in November 2008. It was a popular cave with hundreds of visitors per year. It was especially popular with new cavers and youth groups. To enter the cave, visitors descended into an eight meter deep sinkhole to find a concrete bunker. Entering via the steel plate door, a caver would climb down five meters of stacked railroad ties that supported the bunker and held back the old debris and dirt that filled the bottom half of the sinkhole. Ducking through a low spot, the caver would enter Robber Baron Cave for a trip though its 1500 meters of mazy interconnecting passages. However, in the Fall of 2001 during a meeting to discuss future improvements to the property, a problem was found—the railroad ties no longer had any support on the bottom and were beginning to collapse. For safety, the cave was closed, and the Texas Cave Management Association (TCMA), which owns the cave, now had a difficult task. Robber Baron is not only a popular cave for cavers, it is located in the middle of a highly developed residential neighborhood. It also contains six blind invertebrate species found nowhere else on Earth, two of which are federally listed as endangered. The sinkhole and bunker entrance to Robber Baron Cave prior to the start of the restoration project. 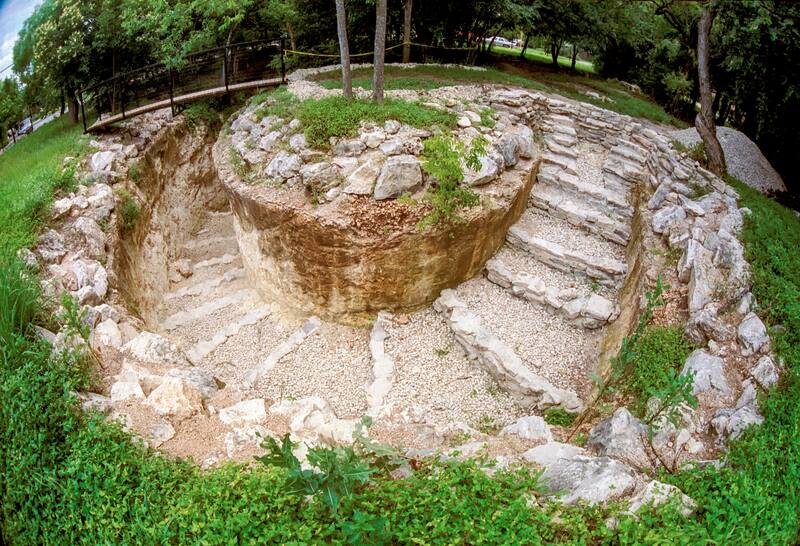 Robber Baron Cave is the longest cave known in San Antonio, Texas and is also the only cave in the county that has been open to the public as a tourist attraction. 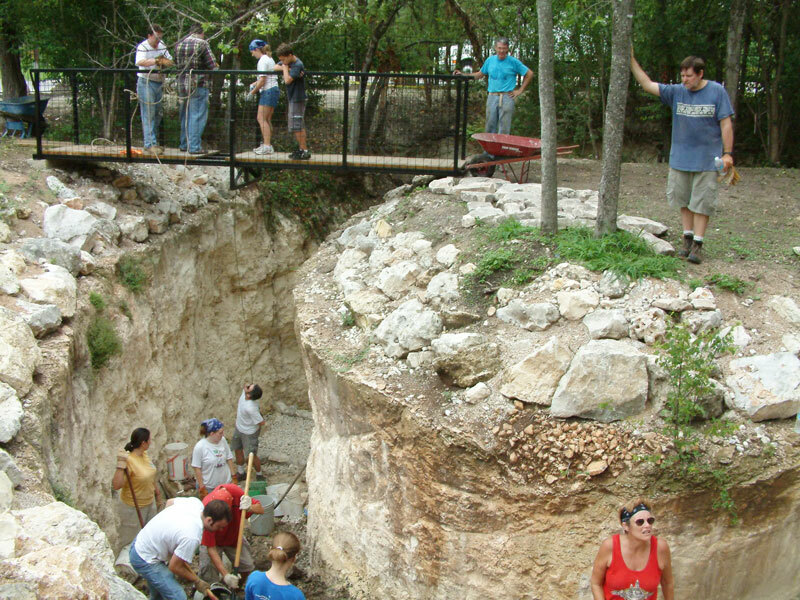 From 1926–1933, an estimated 300,000 people toured the cave, which was then located outside the city on the Old Kings Highway to Austin. Since closing due to the Great Depression, the cave served to commercially grow mushrooms and even served as a speakeasy during prohibition, but mainly fell into disrepair. As the city grew around the cave, it became a local playground for children who risked injury to themselves while vandalizing the cave. In 1980, members of the San Antonio Grotto gated the cave for the owner to limit his liability and stem the tide of damage. They explored and mapped the cave and documented its rich history. Geological and biological studies were also done in the cave, discovering six blind invertebrate species found nowhere else on Earth. In December 2001, two of these species were listed as endangered by the U.S. Fish and Wildlife Service. When the cave’s owner died in 1994, his bequest had the cave donated to the Bexar Grotto, whose members arranged for the TCMA to own it with Bexar Grotto as the cave’s manager. 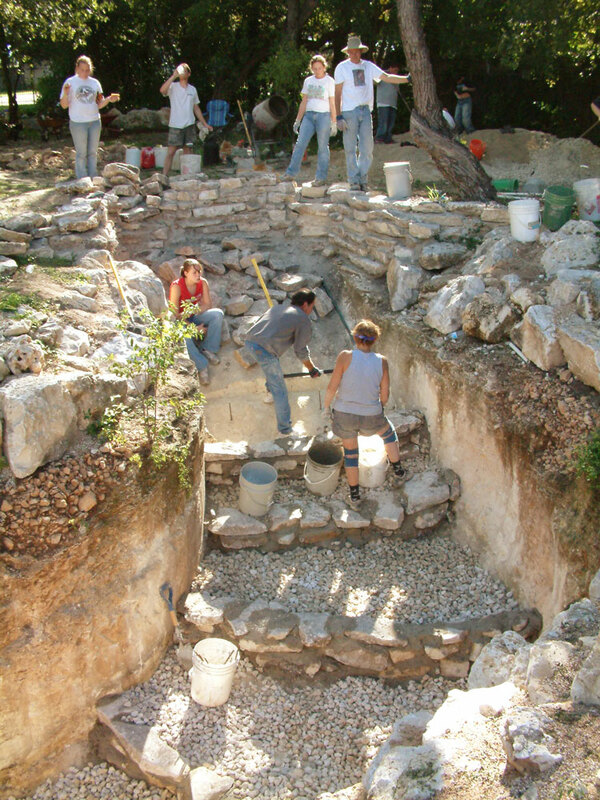 TCMA and the grotto have led many educational trips into the cave and conducted many clean-up projects both below and above ground to be good neighbors to the surrounding homeowners. Now with the cave closed, TCMA formed a committee to develop plans for the future of the cave. TCMA had recently received a grant from the U.S. Fish and Wildlife Service to improve the cave gate and modify the grounds for better management of the listed species, and this was to be major factor guiding the plans for the cave. 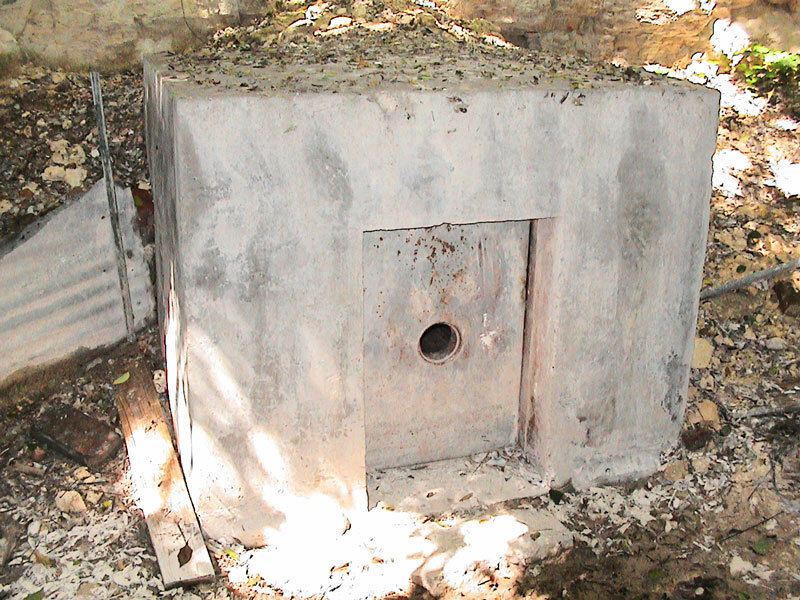 The old bunker gate allowed very little airflow and had no provisions for water or nutrients to enter the cave. After months of discussion, the committee developed an ambitious plan to restore the sinkhole and property to a more natural and native state. Furthermore, access to the cave was to be made safer for cavers and the property surface would be improved for use as an educational resource and park for the neighborhood. Central to the plan was the restoration of the sinkhole to its original state. During the period when Robber Baron was a commercial cave and in the following years, a great deal of trash, debris and sediment had filled the sinkhole with fill ranging in depth from 3–8 meters. Removal of this fill would open up the main entrance and a blocked side entrance to allow a more natural flow of organic material, water, and air into the cave. Furthermore, visitors to the cave would no longer have to climb down a set of potentially slippery and dangerous railroad ties to enter the cave but could walk directly to the entrance. 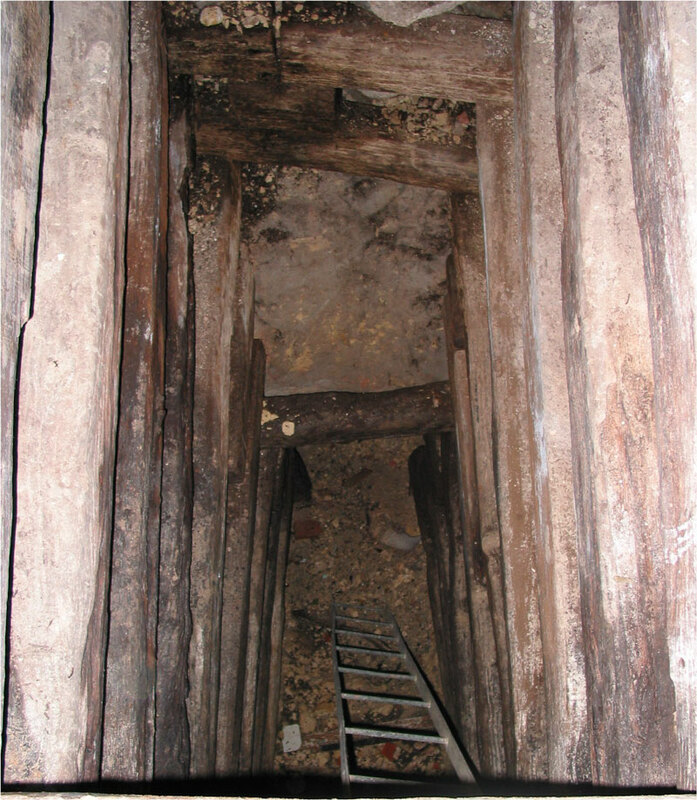 The bunker was supported by stacked railroad ties. To enter the cave, visitors had to climb down a ladder. Photo by George Veni. Heavy equipment was needed to excavate the trench and sinkhole. Photo by George Veni. 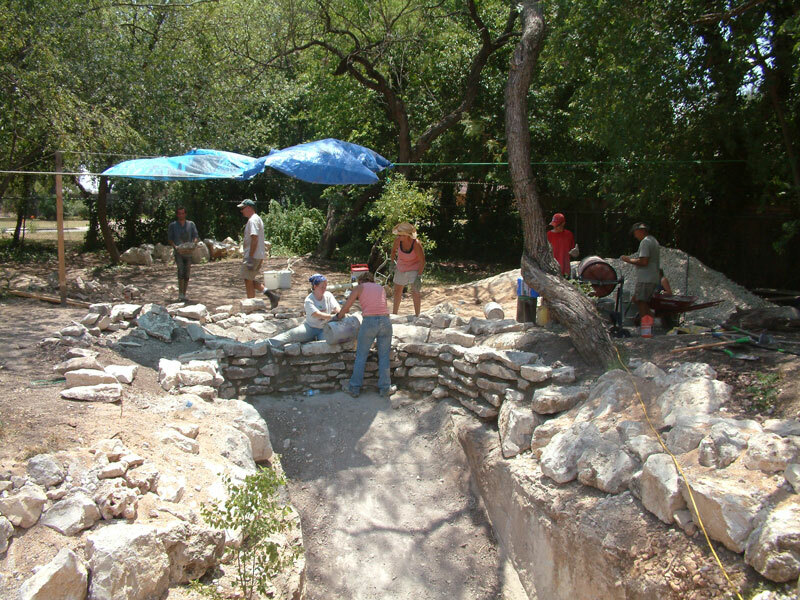 Excavation began in the spring of 2003 with regularly scheduled work weekends attended by volunteers ranging from cavers from all over Texas to families who lived in the neighborhood and just wanted to help out. Through several work trips that spring, heavy construction equipment was used to build a trench into the sinkhole for removal of the fill. 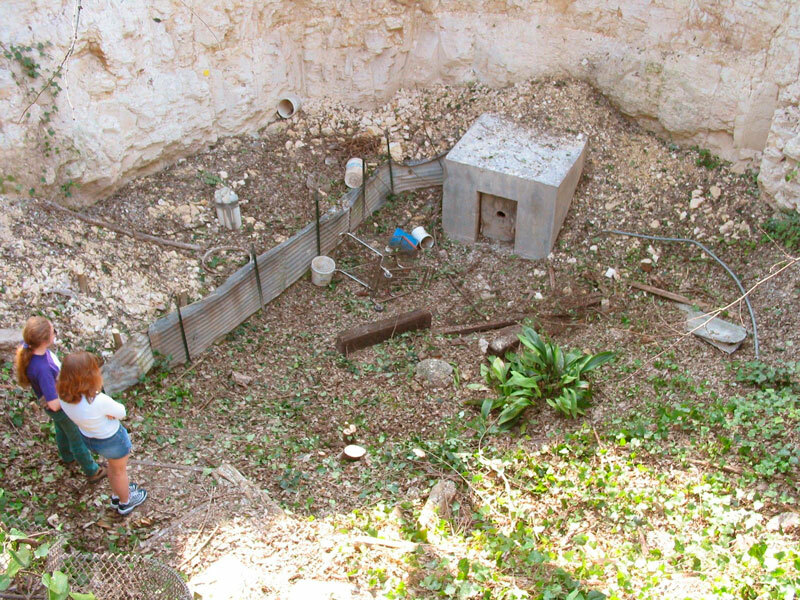 The old bunker entrance was also demolished, and the old entrance was temporarily filled to prevent unauthorized access to the cave. During the summer, work proceeded with removal of material from the sinkhole using a bobcat and excavator. This proved difficult and slow due to the steep grade, narrowness of the trench and small work area in the sinkhole. However, by the end of the summer, about 200 cubic meters had been removed and completion of the sinkhole seemed to be in sight. Then the rains began. Main entrance and historical entrance are finally dug open. Over the next year, the city of San Antonio would receive a record 44 inches of rain—one and half times its normal rate! This brought the Robber Baron project to a complete halt due to the impossibility of working in the sinkhole during rain. Not until mid-summer 2004 was there again a dry enough period to resume work. During an intense work-week in early August, another 100 cubic meters of material was removed from the sinkhole. A couple of weeks later, another long work weekend finally made the big breakthrough and reached the natural entrance to the cave. Over the last weekend of the month, more hard work uncovered the smaller side entrance to the cave that had been blocked up by debris for decades and removed the last of the fill reaching the bedrock bottom of the sinkhole. New, secure gates at Robber Baron Cave that now permit airflow and nutrient flow as well. 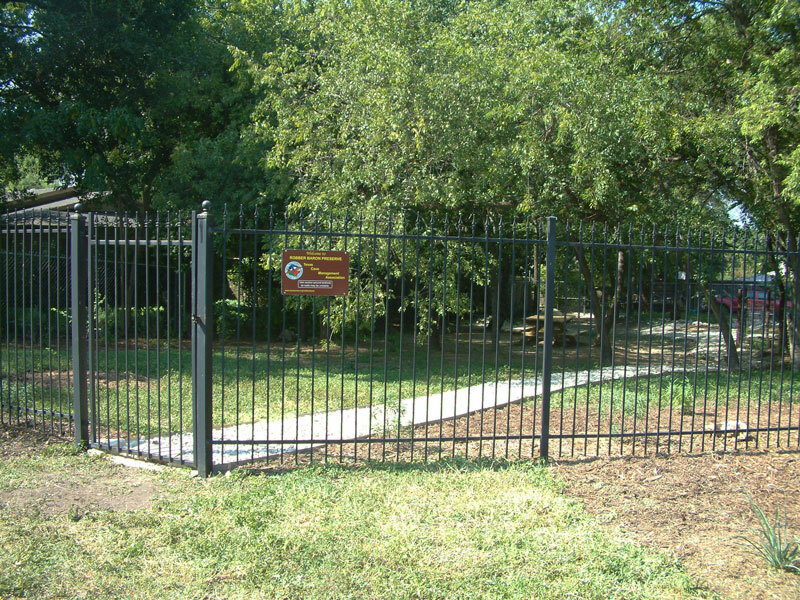 Zara Environmental, which builds cave gates throughout Texas, donated its time to construct a new gate for the cave. The new gate is composed of spaced angle iron embedded into the surrounding bedrock and deeply buried below the entrance, providing a secure gate that still permits airflow and nutrient flow. The small side entrance that was uncovered was permanently gated to allow airflow and animal access, but not to be used as a human entrance. During the fall, there was a return of the rains, but during this time, the material that had been placed in the entrance to block access was removed along with other miscellaneous cleanup activities. At last, the cave was reopened to at least limited visitation. With the completion of the entrance, work moved to the surface of the property. The first portion of the surface work was stabilization of the trench edge and the interior of the sinkhole. During rain events, the trench funneled water into the second cave entrance, forming a lake within the cave and slowly filling in the second entrance. The initial effort to reduce erosion was to dig back the soil at the edge of the trench and stack large rocks to form a retaining wall. A second retaining wall was also constructed on the slope above the second entrance, which has reduced the amount of fill deposited into it. However, the trench presented another issue. It was observed that it funneled water directly from the surface in a rapidly flowing stream straight into the cave, resulting in lots of erosion, lots of sinkhole fill, and a very treacherous climb out when wet. To address these issues, it was proposed to turn the trench into a long staircase providing much easier access to the sinkhole. This portion of the project ended up taking a significant amount of time, requiring eight months to complete. Starting at the bottom of the trench, a series of step-height rock walls were built with fieldstones that were mortared into place. Short lengths of PVC pipe through the walls control drainage through each step. The steps were then backfilled with gravel through which water could slowly percolate. At the top end of the trench, a high rock retaining wall was constructed that diverts surface water away from the trench. Building the retaining wall and stairs leading down the trench. Although the steps largely stopped erosion along the base of the trench, a new erosion problem materialized during the unusually rainy spring and summer of 2007. Waterflow over the sides of the trench was causing small portions of the walls to slowly slough off. It was evident that a more comprehensive solution was needed, so the property was regraded to better control waterflow. The most significant change was to greatly raise the surface along the trench and sections of the sinkhole, forming a berm that gradually slopes away from the edge. Only time will tell if these efforts are successful in finally stabilizing this area. Meanwhile, a number of improvements have been underway on other parts of the property. A major project was replacement of the old industrial-style fence around the property which had been slowly falling down over the years. 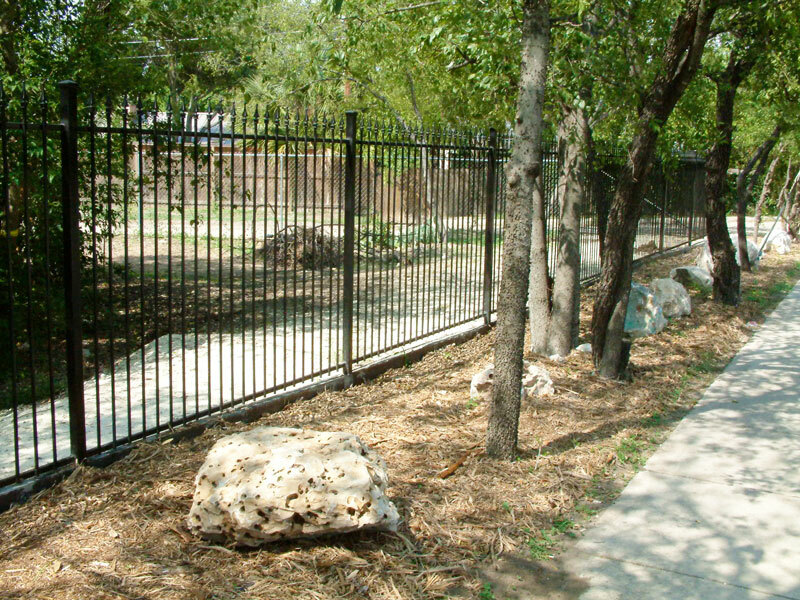 Initially, the section along the alley was replaced with a new chain link fence. Replacement of the main portion along the street fronts became the objective of an Eagle Scout project organized by Nick Navarro in August 2006. He assembled a team and raised money (to which TCMA contributed $2000) to build a decorative black wrought iron fence, which has greatly improved the appearance of the property. The fence features a single person gate along the Camilla side and a larger gate at the corner with the alley. A stone block wall was built up along the central section of the Nacogdoches fence to prevent flooding from the street from entering the sinkhole. Wrought-iron fence built as an Eagle Scout project by Nick Navarro. With the excavated sinkhole now over 30 feet deep and being in the middle of a residential neighborhood, it presented a potential safety hazard for which a second fence was required. This project became the focus of another Eagle Scout project conducted by Matthew Haas in June 2007. The fence around the sinkhole was constructed from wooden posts set in concrete bases with four-foot high “no-climb” fencing material. It features a gate on the backside of the sinkhole to allow for hoisting materials in and out of the cave in the future. Another major improvement has been the bridge over the trench, which was entirely built and donated by longtime volunteer and caver Tom Brown. The bridge makes it easier to get across the property and provides a way to raise and lower buckets during digging and construction. Linking the bridge to the gates and the trench is a stone trail around the property, which was built as an Eagle Project by Jon Montemayor. Along the alley, a gravel parking lot was installed to provide better parking area, replacing the area of mud that used to form after each rainstorm. Coordinating the parking lot installation was done as an Eagle Project by Khalif Halani. Also, a picnic table was built during another scout project to make the property more attractive to visitors. Welcoming entrance signs and a large information kiosk allows visitors to learn about Robber Baron, caves, and TCMA. The new bridge donated by volunteer Tom Brown was used to haul out materials while constructing steps in the trench. 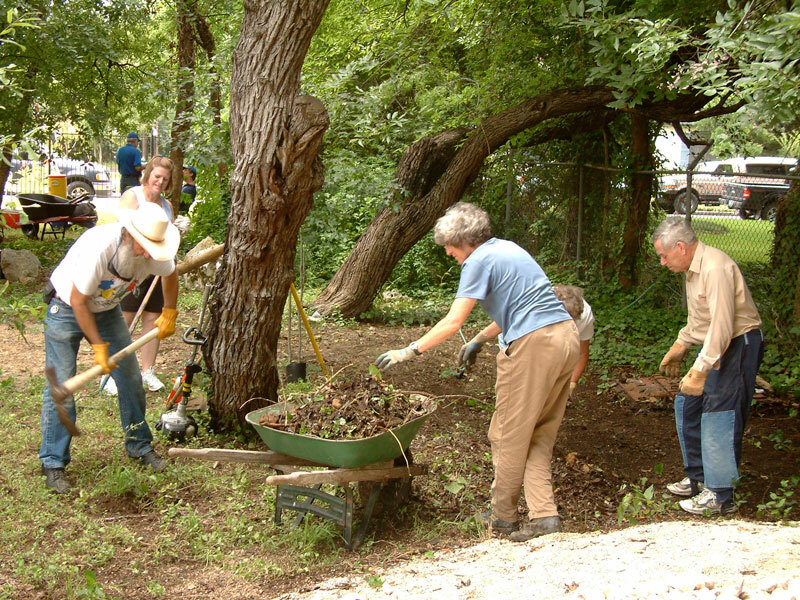 Volunteers help pick up debris on one of many Robber Baron work days. Over the years of working on the project, we been busy removing a great deal of non-native ivy, shrubs, and trees, as well as hauling off numerous loads of brush and trash from the property. In the final phases, we have conducted a major landscaping effort largely lead by Cheryl Hamilton and supported by San Antonio Master Naturalists. A new layer of topsoil was spread across the property and over 80 new xeriscape plants and shrubs were placed at various locations. When established, they will make the surface of the Robber Baron not only more ecologically friendly but also a pleasant and attractive place to visit. During the six years of this project, TCMA has paid over $7,000 in actual expenses and volunteers have contributed over $12,000 in paid expenses. Over 275 volunteers have worked on the site more than 3,700 total person-hours for a total of over $90,000 total in-kind volunteer services. Grants totaling $16,500 have been received from U.S. Fish and Wildlife Service, the Magnolia Charitable Trust, and Texas Parks and Wildlife. In addition to these generous donations, it has been only through the hard work of many, many individuals that this project has succeeded. Robber Baron Cave Preserve has been made into a centerpiece for TCMA for its unique biological and historical resources, for its educational and scientific functions, for a recreational cave for cavers, and as a place that people can visit to learn about and enjoy the world beneath our feet. Completed steps down into the sinkhole of Robber Baron Cave. Photo by Jim Jasek.